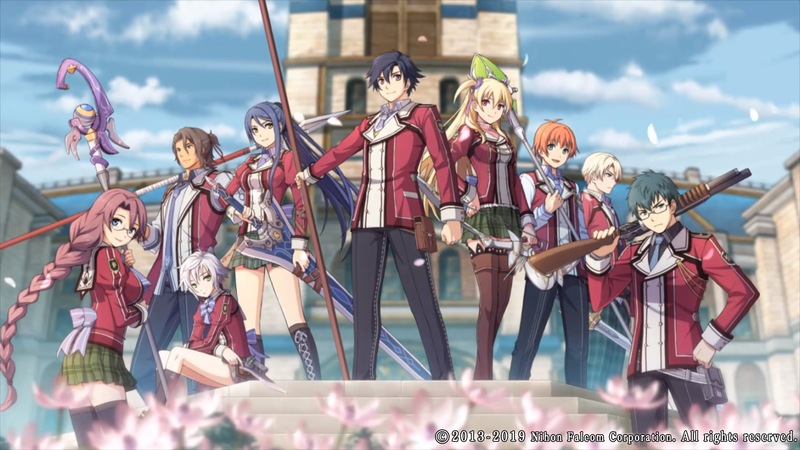 Back in 2016 we encountered a fun RPG series by the name of The Legend of Heroes: Trails of Cold Steel. This series threw us in a fantasy universe, where peace had reigned supreme for a long time, but war was lurking just around the corner. This series was originally designed for PlayStation 3 and PlayStation Vita (and PlayStation TV). With the third game in the series being released somewhere this Fall, Marvelous has taken it upon themselves to release the first iteration on PlayStation 4. Those who bought the enhanced edition on PC don’t have to fret either, as this version received an update to include dual voice options. You can read our original in-depth review of part 1 by clicking here. In this review we’ll be focusing on the reiteration of the game on PlayStation 4. You’ll be thrown into the role of Rean Schwarzer, who is a new cadet at the Thors Military Academy. While you were expecting the normal track that other students go through, you are thrown into a special class that mixes students of a noble descent together with those of commoner blood. This is normally not done, as both layers of the populace are divided in the academy. That being said, you’re part of a new project that matches students depending on their ability to link with one another, making ideal soldiers who can look past each other’s origins. You’re a boy who is struggling to find his place in the world, but it doesn’t take long before the long period of peace is broken, speeding up your journey to adulthood. The amount of story content is rather impressive in this game. Not only is the main plot interesting and captivating, your classmates are intriguing and all the basic NPCs also have different lines to tell you depending on when you talk to them. The story is presented by voiced intermezzos, but also a lot of text windows you’ll have to read. Nihon Falcom has designed a cast of very likeable characters, making sure everyone stands out, making it a lot easier to get to know who the main characters are. The game features a lot of different, more important characters, so in terms of character design the developers certainly did a good job. The game itself does look a bit better than its original PS3 and PS Vita versions, but overall the game feels a bit dated. Many of the game’s areas look and feel empty, and some style choices are somewhat questionable for a modern-day release. 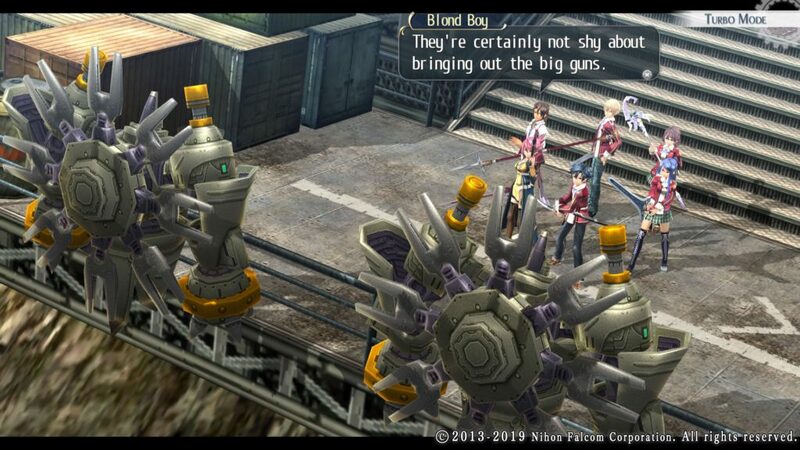 That being said, Trails of Cold Steel still does look charming, and the different environments are diverse, and the same can be said about the enemy encounters. Of course, the game doesn’t hold up to many recent releases in terms of graphical prowess, but we still appreciate the enhanced version, allowing many gamers to get to know this franchise. The sound design in Trails of Cold Steel is spot-on. You’ll be treated to great voice-acting, be it in English or Japanese, and the music accompanying everything in the game is certainly pleasant as well. You’ll have a lot of voiced conversations in the game, but many unvoiced ones as well. The latter isn’t really a problem, as there would simply be too much text to invest everything in voice acting, especially seeing the game has a lot of decent gameplay mechanics as well. If this was a visual novel, things would certainly be different. 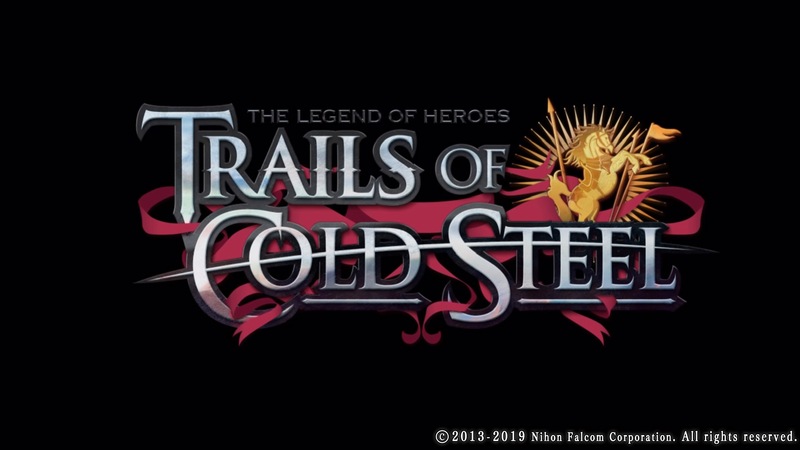 The Legend of Heroes: Trails of Cold Steel is a rather traditional J-RPG that builds upon well-known mechanics. The combat is turn based, and you’ll get a decent amount of side content to explore. You’ll notice that the game offers a lot in terms of character development, and the chance to get to know your fellow classmates and party members better and better depending on who you choose to get to know and the further the game progresses. Overall things are quite clear from the get-go, but the game does have a few unique quirks to spice things up. 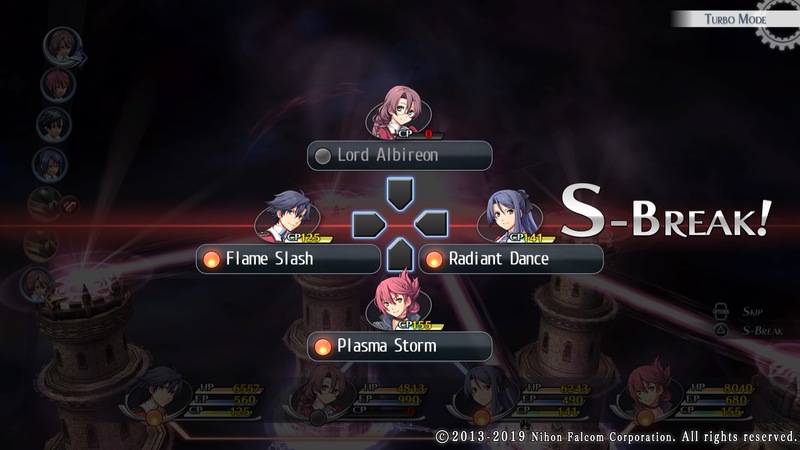 As mentioned above, the combat in Trails of Cold Steel is turn based. On the left hand side you’ll see a bar in which the unit order is presented. Depending on if you stunned the creature mob beforehand or if you were backstabbed, you’ll either have multiple turns, or allow the enemy to go first. When just running into a foe, you’ll have a rather fair order count. Overall this mechanic is fairly standard and it works well for a game such as this. During combat you can move the characters around, and use Arts and Crafts, which either depend on your character or the skills (Quartz) you have equipped. The mechanic with the Quartz allows you to try different builds and the game also has a simple gear system with a few items you can equip. the latter is nothing fancy, but it does add something to the game where you’ll need to save up some money and gems in order to get some better equipment. You’ll play through the game by completing events that make the time progress. During each playable day you’ll have objectives you need to reach to progress, but also those that are optional. The game does mark important items, such as opportunities to bond with your fellow classmen (limited amount per free day, forcing you to choose) but if you go for important story segments first, you’ll lose the ability to play the side-quests. Completionists will have a lot of fun playing through this game, but be wary that you complete your quests in the right order, or you might miss some content. With the extra shoulder buttons available, the game comes with a Turbo mode, which allows you to play the game at double the original speed. This is very useful when backtracking through dungeons, or during a second playthrough where you want to up the pace a little bit. Voiced conversations are not sped up, which means you can enjoy the original voice acting at its normal pace. This mode does not really change the mechanics of the game, but it allows for a quicker flow of the game. It’s not always that easy to control your character when it moves a lot faster though. Another plus that transpired with this version are the reduction of loading times and sometimes even the complete removal thereof. You’ll notice that the quick travel function will go smoothly and even loading a save file only takes a matter of seconds. The game itself feels very fluent and the lack/reduction of loading times is a very big plus. 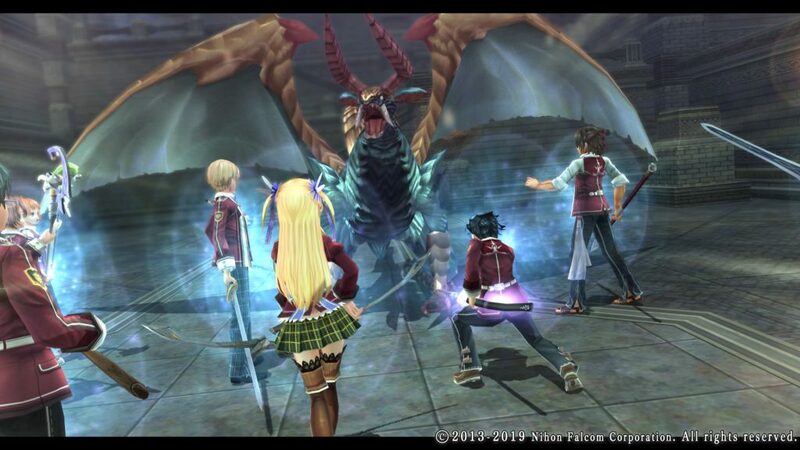 The Legend of Heroes: Trails of Cold Steel is still a great J-RPG to plow through, especially if you have year heart set on getting the third installment of the game. While the graphics and certain mechanics may feel a bit dated or old school, the game is still very much worth investing time into because of its story value and the different side-activities you can indulge in. If you missed the game the first time around, we suggest picking up the PlayStation 4 version, and those looking for a fun replay session might also get a lot of fun out of this updated version.